The Games We Played – The Original Grand Theft Auto (PC) | OhGizmo! It really wasn’t until the infamous third iteration of Grand Theft Auto that the game became a target for the media and the poster child for video game violence. But believe it or not, many of us were stealing cars and committing unspeakable acts of civil disobedience long before GTAIII was even announced. That’s right, while it might have lacked the fancy 3D graphics of its descendants, the original Grand Theft Auto was still a heck of a lot of fun. 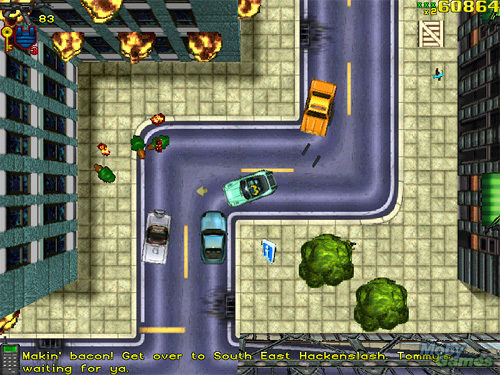 The game featured a top-down perspective of the original versions of Liberty City, San Andreas and Vice City, and relied heavily on sprite animations for the cars and characters, though 3D effects were sparingly used for the buildings and other elements. Oddly enough, I don’t remember seeing the original Grand Theft Auto pop-up on the evening news in stories about how it was corrupting our youth, even though you could pretty much do everything you can do in the current versions of the game. I guess sprite-based characters just aren’t as endearing or realistic as their modern 3D counterparts. I remember when this game came out. It was so special because people were talking about banning it for it's violent and criminal intentions. Also, it came out at the same time as another “evil” game – Carmageddon, which oposite to Grand theft Auto managed to get banned in it's original version in some countries. I still think back on both those games as fun, mostly due to their sandbox style as you mention, those were some of the first games that really implemented that in a good way! Ha ha Roni… Carmageddon.. I had forgotten about that game! I still pull out GTA regularly and get my wife and friends into a LAN game. It seems to work best with IPX/SPX! If anyone knows what key to hit to chat in the game, I'd love to know. I've never found it. GTA 2 is also free from Rockstar now but the original is still more fun! I think the free package contains GTA London too and that's also extreme fun with a few friends. We've had 24+ hours of GTA lan gaming straight many times. I also got the fist one wayyy back then when it first came out, it was awesome. One of the thing that has disappointed me about the 3D sequels is that they didn't include the hare krishna monks, it was so satisfying to run them over all at once or to kill the leader and have the rest of them follow you around afterwards…aaahhh, good times.